Moss can be attractive. Japanese gardeners cultivate it as ground cover in parts of traditional gardens that get a lot of shade. It usually isn't attractive when it's growing on your lawn, however, and its presence is usually a sign that the soil is too acidic. You can use a number of commercial chemicals to kill moss, but part of the eradication procedure involves amending the soil to encourage grass to grow to replace it. Moss also grows on roofs. That isn't necessarily problematic, but it can be, because moss doesn't look all that pleasant on an otherwise clean roof, and it can cause leaks. You can kill roof moss with a bleach solution, but you still have to physically remove it after it turns brown. Moss doesn't compete with grass -- it simply starts growing on bare spots, and the fact that some spots are bare has something to do with the soil composition or the amount of shade. The soil may be compacted and drain poorly, for example, or overhanging branches may prevent certain areas from receiving enough sun to support grass. The presence of moss often has something to do with soil pH. Grass needs neutral or slightly alkaline soil, but moss can thrive in soil with a pH well below 7. Thoroughly wet the moss with the moss killer, and wait for it to die. You may need to add more at one-week intervals. You may be able to get most of the moss up with a rake, but sometimes you have to dig it out. Be sure to dig down deep enough to get some of the soil underneath. Before adding fertilizer, lime or any other amendment, test the soil to know what chemicals it needs. Take a small sample to your local garden center. Moss can establish itself on shady parts of the roof, typically the north side and any areas under branches or otherwise out of direct sunlight. Long-term moss growth can deteriorate shingles and cause them to lift, allowing water to seep underneath and leak into the attic. 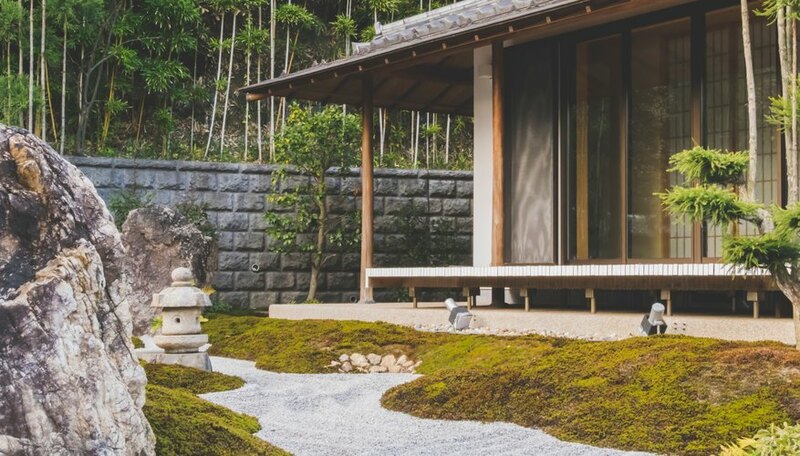 Moss can also prevent debris from sliding off the roof, allowing it to turn into dams that create standing water that also eventually seeps through. You may also have to deal with moss growing on parts of your patio or driveway. Beside being unsightly, these moss growths can become slippery in wet weather. An easy and effective way to kill roof or patio moss is to spray it with a 50/50 solution of household bleach and water. If water runs directly off the roof, spread plastic over to the ground foliage around the foundation to protect it before using this bleach treatment. When removing patio moss, spray the surrounding foliage with water prior to the bleach treatment for protection. Bleach kills moss instantly, but it takes from one week to several for the moss to turn brown and loosen its grip on the shingles or concrete. When it does this, use a rake or hard-bristle push broom to scrape it off. When raking moss off the roof, remember to always stroke along the downward slope of the roof to avoid lifting and breaking shingles.